Women have also been conspicuously active in the protests throughout the Arab world. Yemeni women have made a particularly strong showing in demonstrations against the regime of President Ali Abdullah Saleh, a revolution that "started on a very small scale," writes Afrah Nasser, a 25-year-old Yemeni journalist and blogger from Sana'a. "There were only about ten women" at the start of the protests in Sanaa. "But with each day, it has been noticeable how the numbers of women grew as female protesters brought their sisters, cousins, friends. ... Women are treated with grace and respect in the square. ... Usually in Yemen, women get harassed all the time, but in Change Square nobody touches me." 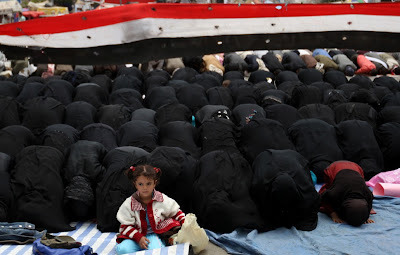 Above, a young girl sits alongside Yemeni women performing noon prayer during anti-government protests in Sanaa on March 19.